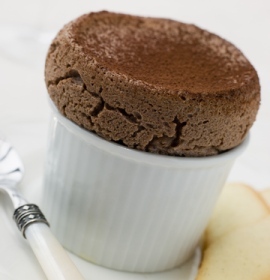 One of my favorite chocolate dessert recipes is this yummy chocolate soufflé recipe. Light, creamy and delicious, this luscious chocolate recipe is surprisingly easy to make. There are a few steps involved but you can see that none of them are difficult or overly time-consuming. Melt the butter in a pan and stir in the flour. Remove from the heat and stir in the milk. Return to heat and bring to a boil, stirring. Cook gently for 2 minutes, stirring all the time. Remove from the heat and stir in the chocolate and egg yolks. Beat the egg whites until stiff. Beat in the sugar a little at a time. Fold the chocolate sauce into the egg whites. Pour the mixture into a greased 2 1/4 pint soufflé dish. Bake for about 35 to 40 minutes until well risen and firm. Serve immediately, dredged with confectioner's or powdered sugar. Make sure that your egg whites are beaten until they form stiff peaks, as that will help to ensure a nice high soufflé. Timing is crucial with a soufflé as they really do need to be served as soon as they come out of the oven. Time out of the oven means a flatter soufflé. Use the best quality chocolate that you can find, preferably a dark chocolate rather than milk chocolate. The dark chocolate not only gives a richer flavor, it’s healthier too. Once you see how easy this chocolate soufflé recipe really is, you will put in on the menu often. It’s a perfect dessert to top off a romantic dinner for two, but the ladies will thank you too if you serve this at your next girls night in. Want another sinfully good chocolate dessert recipe to go with this chocolate souffle recipe? Look here for our chocolate lava cake.